Some of the religious scholars in the Maldives have expressed their support for the running mate of PPM in the upcoming Presidential Election, Dr. Mohamed Shaheem Ali Saeed. At a press conference held by today, the support for PPM was candidate was announced by Sheikh Mohamed Nasheed Adam, Sheikh Mohamed Latheef, Sheikh Izzuddeen Adnan, Sheikh Mohamed Didi, Sheikh Ahmed Shafeeq, Dr. Qubad Abubakr, Sheikh Nasrulla Ali, Sheikh Haisham Mohamed and Sheikh Ali Rila Ahmed. Speaking at the press conference, the Deputy Minister at the Islamic Ministry, Asadulla Shafee said that the show of support for President Yameen from the scholars come after Dr. Shaheem, a notable religious scholar, was selected as his running mate. Asadhulla Shafee said that it shows how much President Yameen offers opportunities for scholars. He said that Dr. Shaheem becoming the Vice President would be good for the religious scholars in the country. 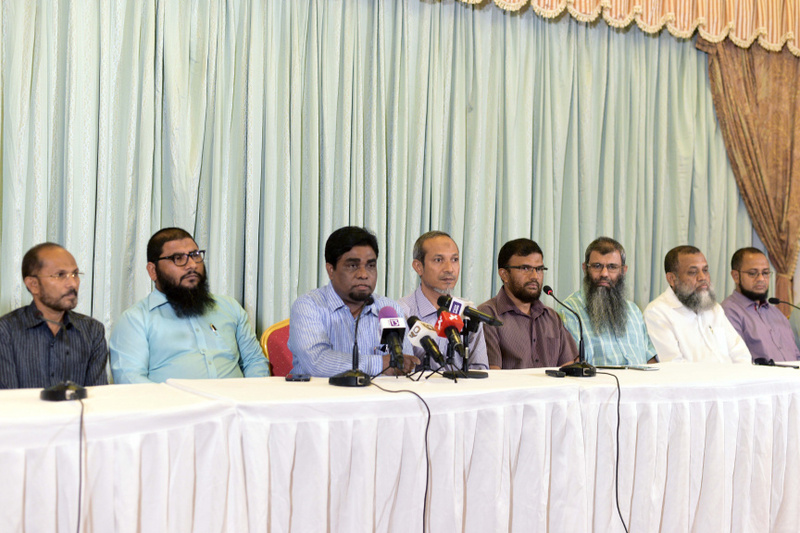 Aside from the scholars who took part in the press conference today, famous religious scholars, Sheikh Ali Zahir and Sheikh Ahmed Sameer took to social media to expressed their support for the decision. Today's press conference announced that more scholars are going to publicly announce their support for the PPM running mate in a future press conference.